A Jawbone fossil discovered in Israel could reset the clock for modern human evolution, changing the history of our species. According to scientists the jawbone fossil dates back 170,000—200,000 years, and is the earliest known record of Homo Sapiens ever found outside of Africa, suggesting that the first migration of Homo Sapiens out of Africa was 60,000 years earlier than previously documented. 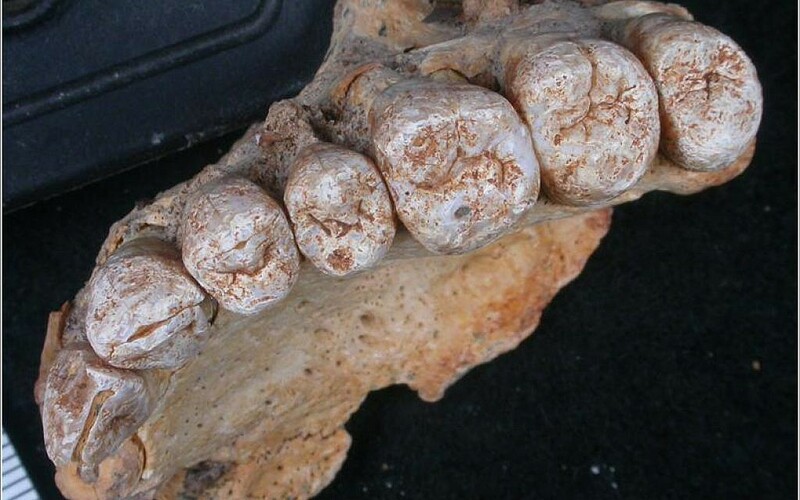 The fossil was discovered in 2002 during an excavation of the prehistoric Misliya Cave, and after an exhausting 15 years of research by an international, multidisciplinary team, the upper jawbone, complete with several teeth was successfully dated to up to 200,000 years. “What Misliya tells us is that modern humans left Africa not 100,000 years ago, but 200,000 years ago,” said Hershkovitz. “This is a revolution in the way we understand the evolution of our own species. This has changed the whole concept of modern human evolution,” added Prof. Hershkovitz. To determine the species to which the maxilla of Misliya belongs, researchers have made both classical anthropological measurements of the maxilla and teeth, as well as tomography and computerized axial microtomography analysis that has allowed studying the internal anatomy of the fossil and comparing its shape through reconstructions and virtual models in 3D. The comparison with fossils of African, European and Asian hominids and with recent human populations has shown that this fossil belongs unmistakably to an archaic modern human. “Neither the maxilla nor the teeth share any of the features that characterize other human species, including the unique Neandertals,” says Jose Miguel Carretero, director of the Laboratory of Human Evolution (LEH) at the University of Burgos. According to previous studies of human fossils found in Ethiopia, scientists have maintained for half a century that modern humans originated in Africa—the cradle of mankind—some 160,000—200,000 years ago. They maintained the earliest record outside of Africa was between 90,000 and 120,000 years ago. However, with the discovery of the jawbone from the Misliya cave, the history of human evolution needs to be rewritten. The Jawbone not only resets the date for Homo sapien evolution, but it also suggests how the modern man did not evolve independently but rather alongside—and interbred with many other hominin groups, explained Hershkovitz. Researchers also discovered stone tools and weapons near the cave meaning that its inhabitants were very capable hunters, who used sling projectiles and intricately carved blades to hunt gazelles, oryx, wild boars, hares, turtles, and ostrich. According to Radioactive dating, the tools date back between 177,000 and 194,000 years. Furthermore, Hershkovitz explains that there are indicators which suggest that early humans traveled out of Africa whenever the climate allowed it. The research presenting the discovery was published in the prestigious Science magazine.